DNA samples have been taken from a pair of seals thought to be the first twins born on the Farne Islands, off the Northumberland coast. The grey seal pups were spotted in October by National Trust ranger David Steel, who had been monitoring a pregnant seal. Multiple births in grey seals are rare and no records existed of any having been born on the islands before. DNA samples have now been taken by the Sea Mammal Research Unit. Mr Steel said: "Both are doing well and are close to independence. "With the help of the Sea Mammal Research Unit, a DNA sample has been taken from both pups so we can prove without doubt that we do have a pair of grey seal twins - the first ever wild documented occurrence. "As part of the process, we also took their body weights, which are hovering around the 31kg mark, so hopefully they'll be heading for a huge success. "The Farnes has certainly produced some noticeable highlights this year and this is one of them." 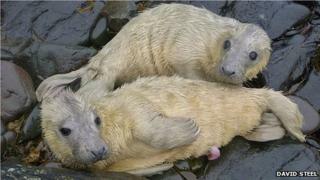 Ailsa Hall, acting director of the Sea Mammal Research Unit at the University of St Andrews, said it was "extremely rare" for twins to be born in grey seals and to her knowledge had not been recorded anywhere. The Farne Islands are known for their huge seal colony and around 1,500 pups are born there each year.